A Dog is the most faithful animal who will protect you from all the bad things till his last breath. But who will protect him? What if one day you come home and your precious dog is not there? Where did he go? where he got lost? He must be scared by seeing so many new faces and not finding a way back home. 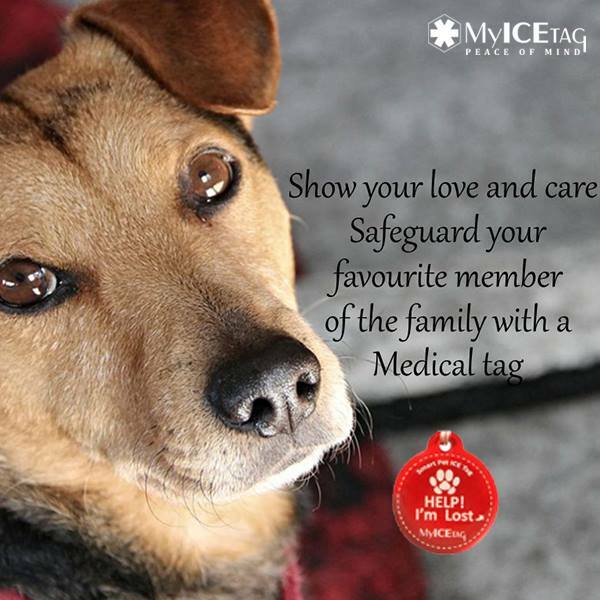 For avoiding such conditions, MyICETag presents Dog ID tags to help you find your dog, it will act as a GPS for your dog to monitor him even when you are not around him. It works as the guide on what to do and what not to do with your dog i.e. it will have the information about your dog’s allergies, his medications, his treatments & his illnesses. This Medical ID tag consists of owner’s information as well as your name, address, and contacts no. All a person has to do is scan the QR Code present on your dog’s collar ID tag and you will receive an alert about his location. The person must have MyICETag App which can be downloaded from the Google App Store available for both IOS and Android. Although these are only for finding and keeping your dog safe. So make sure, if he goes missing again he must be wearing these ID tags. This product acts and speaks for your dog. These are also available for Kids and elders in form of Medical Wristbands, Keychains and Bracelets’ in several colors. It is for the whole family who is health conscious and for those unthinkable moments in which you don’t know what to do, this product works wonders. Buy this product from online now starting from an affordable range of ₹350 and never worry about your family’s safety. A Dog is the most faithful animal who will protect you from all the bad things till his last breath.